MOPP's Drops have as main foundation the same basic composition as the one already in use with MOPP's Drink. This very special recipe allows the creation of organic sweets, consisting of natural ingredients and nothing else! The resulting "goodies" enthuse with a highly tempting, brand new route of flavour. Trial tastings/ testings gave proof, with MOPP's´ very own and extraordinary combination of ingredients all bon vivants can be reached. Connoisseurs who know the value of - likewise love an utterly new, outstanding aromatic herbal-spicy taste experience. For advertising, the stylish in-scene pugshead-logo is more than essential. Undisputed it does stand in the centre of general attention, representing all products. Via the pug as object of affection, a young and youthful customer base is being addressed. Soon people will meet our brand with an almost intimate kind of familiarity. Special packaging, including the pugshead-logo in retro-style as central emblem, immediately stirs the curiosity and ensuing leads to our products. 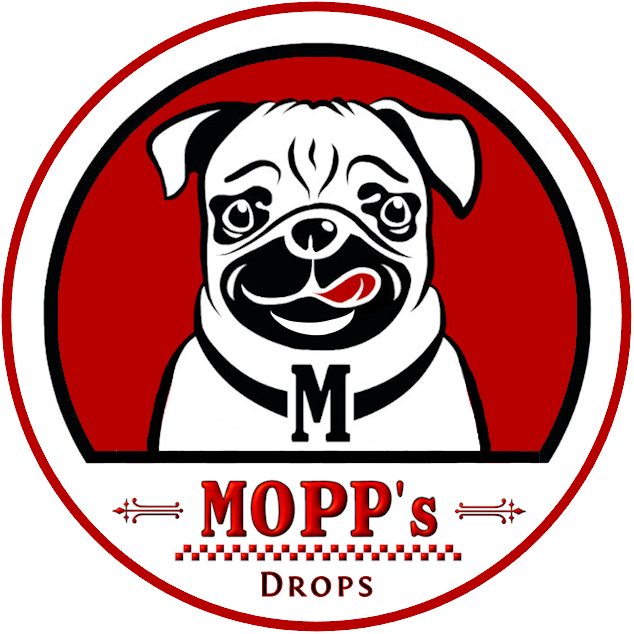 MOPP's Drops have an individual and at the same time also typical taste. Through the exquisitely refined mixture of ingredients, MOPP's Drops simply cannot be compared to any sweets of its kind on the market. With use of BIO-Natur basic ingredients (pure organic sweeteners, even pure fruit juice concentrates), obtaining the official 'purely organic' label is absolutely within the range of possibilities.